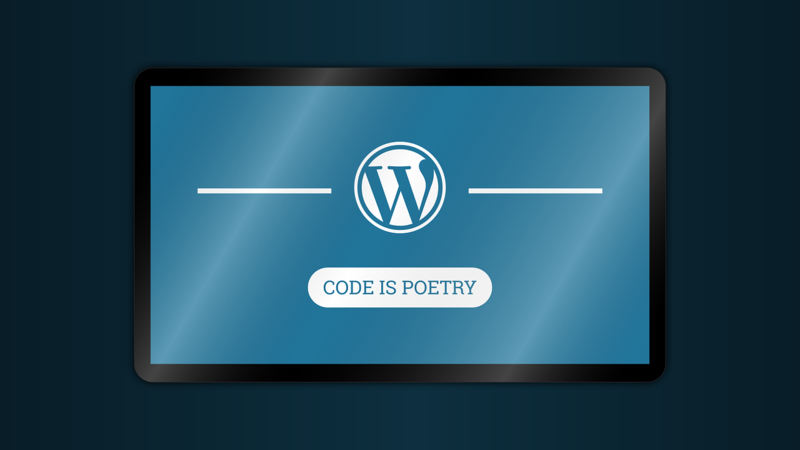 If you are using WordPress for your blog like the rest of the world (except for my grandmother who doesn’t blog), youÂ may have already heard of the Thesis theme. In my opinion, it’s one of the most customizable and flexible themes ever built. It includes a lot of design, search engine optimization, presentation, and content options for your blog, which is why I decided to purchase it. Yes, it’s a paid WordPress theme, so you will have to shell out some cash to take advantage of the power it can add to your WordPress blog. I will do another post on why I think it’s a killer theme, but for now, we’ll focus on one of the things that you’ll probably want to customize after you buy the theme. I’ve started customizing my Thesis installation — to make it more different from the default theme that I got when I purchased the theme. One of the first things that I wanted to do was to change the footer to link to metahead.com, instead of to diythemes.com. Here’s how I did it (and this is very possibly the simplest way to do it). 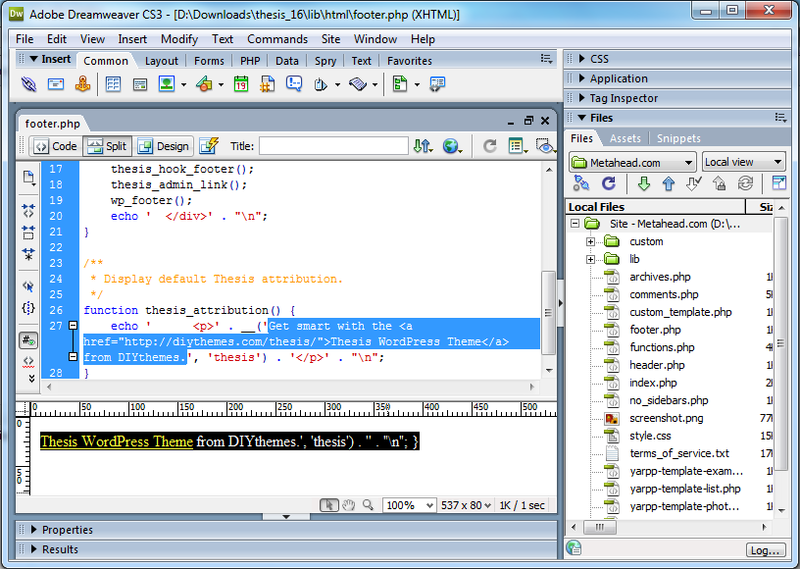 Using a text or HTML editor, open footer.php that is located in the libhtml folder of the theme. Make sure you view the source code. Edit the following text: Get smart with the <a href="http://diythemes.com/thesis/">Thesis WordPress Theme</a> from DIYthemes. to change it to your own footer. I changed the footer for metahead.com to: Copyright &copy; 2010 Metahead.com <a href="http://www.metahead.com/">Make Money Online</a>. See the highlighted text in the screen shot at the end of the post. Upload footer.php to your Web host. You have completed editing the footer of the Thesis theme for WordPress. Now go visit your site and check your new footer! I felt the same way, that’s why I switched to the Genesis Framework. They have a support forum that’s pretty responsive. I never had issues with special characters in the footer. What character encoding are you using? What specific special character are you trying to add? @Oliver: I didn’t test if the method that I described is upgradeable. And I’ve switched to the Genesis Theme so I won’t be able to test anytime soon. But thanks for sharing that info. Should be useful to other readers who are using the Thesis Theme. As much as I love Thesis for its features, I'm getting a little tired of having to look for information on how to address problems that have far more online documentation and discussion for standard WordPress installations. Not having a footer.php explicitly listed in WordPress' Edit Themes admin page is annoying as hell. It was a great help. Finally I have done it. But not able to use special characters in the Footer any Idea ?? This is a good idea, but I still think the Thesis framework is a bit over rated. You have to have some experience with blogging to get the full benefit of it because there are a lot of options. But then again, I guess that sort of flexibility is why so many people like it. I don't think it's a good idea and the right way to do it, to edit the files in the lib directory. That would break upgradeability of Thesis. You should accomplish it by using hooks and editing the files custom_functions.php in the /custom/ folder instead. Thanks for the advice. Thesis looks like a very versatile theme and have heard more of it recently. Wonder how it compares to the Flexsqueeze that comes with a squeeze page. I've heard Thesis theme but not actually tried it. But thanks for the short tutorial we may never know I will be using this theme in the future. Thanks for this tip! I'm getting a hard time fixing this one. This is the first Thesis tutorial on footer editing that I've found that mentions the libhtml folder. Thank you.